Scorpion in Beer bottle shocks people! Sri Ramachandra Murthy April 17, 2019 12:00 IST Scorpion in Beer bottle shocks people! 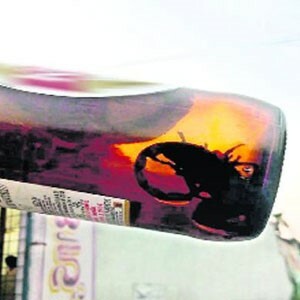 Located in Warangal district, Parakala village has been the centre stage of news in Andhra Pradesh due to unexpected reasons, as few days back a young man had been to a wine shop located close to the RTC depot of the village and the person had asked for a beer and much to his shock, there was a scorpion inside the bottle of beer. This despite the fact that it was a sealed bottle and without even seeing it the man started drinking beer from the bottle and he was not aware of it, and only when he finished and emptied the bottle did he notice that during last peg he was able to observe dead remains of the scorpion came near the bottle opening. Following this the person was extremely shocked and frightened of the poisonous impacts and started a fight with the shop owner for which the owner said he did not manufacture it and just sells it and after this a complaint was sent to excise team and investigation is expected.